I had great experience with Bertha and her team at Oceans Weddings. I cannot express how amazing, professional, and kind her team was. I had talked to many other planers before I finally found her, but when I did, I could immediately tell that I was talking to someone that understood and cared about I wanted. She made me feel very comfortable and put me at ease. The location was amazing and so was the suite that they offered for the the bride & groom to have their privacy and get ready. The decorations and of course the back drop where beautiful. I had sent her a picture of a cake I wanted and it turned out identical! The whole team was very nice and professional, this also included the hair and make-up people and photographer. Thank you Bertha and Oceans Weddings for my amazing wedding day. Great customer service and fast response. Definitely made us feel special on our wedding day. 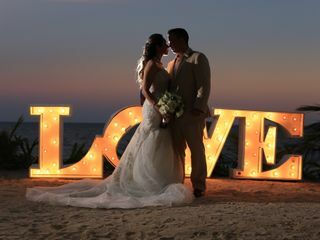 Wanna get married in Cancun? Look no further! Ocean Weddings made my pinterest boards come to life. We wanted to get married on the one year anniversary of our first date so we had a very speedy wedding planning process. We wanted to get married on a beach in a tropical place we had both never been. Most people think this was crazy but we found it exciting. I'm not gonna lie before I connected with Bertha Cano at Ocean Weddings, I was super stressed. Planning a wedding in a place you've never been can be a nightmare- unless you have Bertha and her team on your side! After calling way too many resorts with all sorts of ridiculous rules and pricing schemes I found Ocean Weddings online. I reached out to Bertha and she called me right back. We talked through the dates and details and she had a budget to me in no time. The entire wedding budget would have translated to just a rental fee in Napa, CA (another contender for our wedding location). 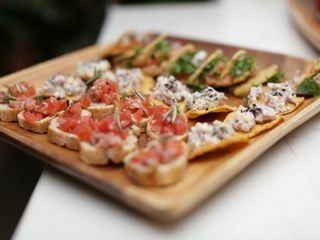 Food: We are foodies so we wanted an amazing caterer. 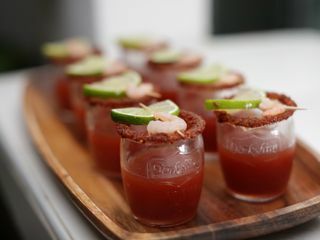 We wanted traditional Mexican dishes with a modern flair- a meat and fish dish and great appetizers. The caterers menu didn't include everything we needed but Bertha worked with them to make things perfect. As she did with all the vendors!! I was super stressed but they turned out to be amazing. The day we arrived in Cancun Bertha sent flowers to our room and picked us up to do a tasting. All of the food was beautifully presented and equally delicious. 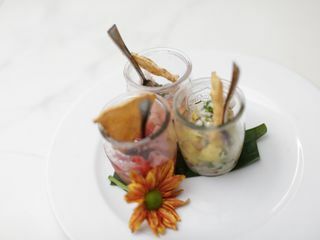 My guest still talk about how it was the best wedding food they have ever had! Drinks: Well after our tasting we got to go to a wholesaler and pick out what we wanted. It was perfect, we were able to customize our selections to our guest. Aged Macallan for my fiance, Siete Leguas Tequila for me, etc. The mixers were included. We even told Bertha what we would be drinking and she made sure the wait staff always kept our glasses full!! Linens/Location/Lighting/DJ/Trio: Bertha took care of it all! Gorgeous!!! Bertha was above and beyond amazing! 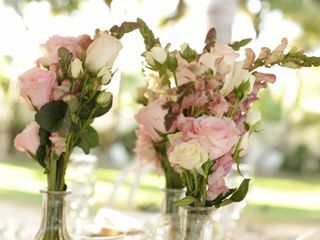 She truly made our day so special - from beautiful decor of the venue to delicious food, she put great details on everything and wow'ed everyone in our party. Also she connected us with many great local professionals at a reasonable price. Thank you so so much, Bertha, you really deserve full 5-stars!! When my husband and I had first decided to plan a destination wedding, we had emailed numerous locations but always got an automatic response stating that it would be a number of months before we would be contacted. 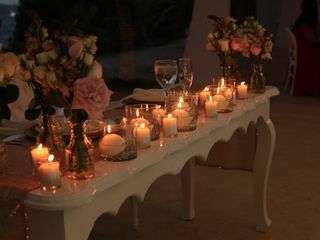 It was by chance that I came across Oceans Weddings online through someone's blog about destination weddings. I clicked on the link and came to the Oceans Wedding website. I was impressed with the photos of the venue so I contacted the email listed on the site. Within hours Bertha had responded, and within a week I was given quotes and planning details. The rest of our planning experience had been the same. Bertha was always there to answer our questions and make recommendations. I planned my entire wedding around this venue because of the outstanding service and response I received from the very beginning. I had never been to Mexico before, and planning an event from afar made me a bit nervous, but Bertha and her team made it so easy for me. I visited the venue the year before the wedding to meet with the vendors. The photos on the website did not do the site justice. The space is unbelievably beautiful, well manicured, and private. Bertha is such a fantastic event planner. She really went above and beyond for us. Bertha had arranged for us to meet each vendor and do taste testings for all the food. Everything was planned so well. The wedding day was one of the best days of our lives. Everything looked stunning and tasted delicious. The timing of every detail was perfect. We didn't have to worry about a thing, and were able to just enjoy the day and have a great time with everyone we love. Every vendor Bertha recommended to us was fabulous. We had even had a welcome/rehearsal dinner at our hotel a few days prior to the wedding where Bertha had been in touch with the hotel event coordinator and had added some extra touches. She was involved in every detail and we are so appreciative for making our entire wedding unforgettable. Bertha was wonderful to work with. She was professional and yet very friendly and approachable. She was easy to work with and caring. She helped us throughout the process and heard my requests. I made very few ones but she nailed them perfectly. We were completely satisfied with her services! todo fue excelente, tanto el trato como el lugar. 1000% recomendable!!! El lugar es precioso, todos nuestros invitados estuvieron fascinados con la locación. Mi boda fue por la tarde así que se podía apreciar perfectamente todo el hermoso Mar Caribe. A parte de ser bello, fresco y cómodo, es además un lugar que le facilita su trabajo a todos los proveedores, la cocina cuenta con todo lo necesario refrigerador, hieleras, etc , los baños son amplios y el jardín junto con la vista al mar crean una atmósfera innovadora, diferente e ideal para toda la familia. Gracias Sra Bertha por sus atenciones y por brindarnos la oportunidad de casarnos en tan bello lugar. Awesome place , incredible service , flowers, music, everything was perfect . The Best day of may life . Mariana and her team made everything prefect for our wedding. 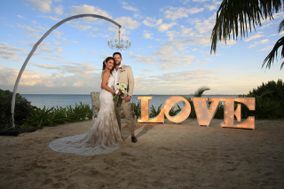 Coming from Australia to Cancun was a worry but for Mariana it was no problem and everything was amazing on the day. 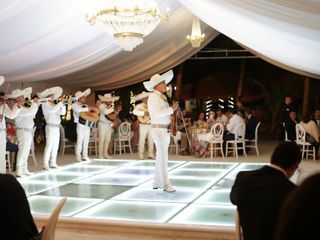 We would hight recommend their services, the location is perfect, band and food was great! Realizamos nuestra boda el 18 de noviembre del 2018 en ocean weddings y todo quedó excelente, durante todo el proceso de la preparación siempre nos sentimos apoyados por nuestra wedding planner Mariana, la cual siempre te atiende con la mejor actitud y te ayuda a aterrizar lo que tienes en mente con fotos o imágenes. En cuanto al lugar, está excelente, cuenta con todo para que tanto tú como los invitados pasen un buen momento. El servicio de los meseros es de calidad, la comida bastante rica y el grupo musical sabe poner el ambiente. Además Mariana cuenta con proveedores que no te fallarán en ese día tan especial. Without doubt Ocean Weddings was the best place we could choose for our big day. Since the first day we met Bertha, she convinced us about the high quality of her service, she took a lot of time with us, in one day we could arrange a lot, tasting, church, explained, helped, it was very nice to talk to her. We live in Germany and we know how difficult it is to arrange a wedding from the distance, however Bertha was always ready to talk anytime we needed, sometimes the communication might have not been perfect, sometimes it took longer than we hoped to arrange what we needed or we understood each other differently, but Bertha was always kind, never lost her nerve and in the end everything always worked out well. She was always trying to adjust to our needs, giving good advices and ideas, she was never pushy to get this, buy that, she was always very pragmatic where we can get what cheaper, she has no vendors fees, we brought our own photo and video without problems, and buying our own alcohol was a big plus, too. Even 3 days before the wedding we could arrange all the last details in one day! The menu was delicious, the table and bar service excellent, the venue looked even better on our wedding day than we imagined. During the wedding we didn't have to think about almost anything, everything we agreed on was running as smoothly as possible, some details a bit chaotic but that is at every wedding, we were amazed how almost everything worked out great or even better than we agreed. All the guests praised the service, the food, the location. The venue is completely private and safe, Bertha and her team speak both Spanish and English perfectly. So we just want to say a big thank you for all your support and help, you are an amazing team and we can recommend Ocean weddings totally. Bertha is an amazing person. I'm very undecided and I was changing my mind all the time, but she was very flexible with everytime (including the schedule) and took care of every detail! The place is so beautiful, the cupcakes I ordered were delicious and very well arranged with flowers. It was worth the money! My photos were just perfect with this lovely landscape. I highly recommend having your ceremony and reception at the "Ocean Weddings" room. The location is just beautiful. The ceremony at the gorgeous gazebo was a dream!!!. The sea view and beautiful gardens were perfect for the photo shoot. Mrs. Bertha Cano and her staff were very attentive and helpful. Todo estuvo excelente, sólo recomiendo que ocasiones futuras, existan controles o recibos para los pagos de servicios que adicionales y/o horas extras a lo contratado; por ejemplo, las del DJ o los platos extras que se sirvan. R el precio que se paga deberian de regalar una hr aunque no se contraten todos los servicios. We want Ocean Weddings to be the best option for our costumers. Everyday Ocean Weddings is working on having the best facilities for our couples. We have already remodel the men's bathroom and we are in the process to have accommodations for our couples.